It is our desire to bring you only the best packaging that will be the most popular with today's consumers. When you buy packaging from us you can be assured it is of the highest quality produced! Not sure what to select? Call us at 1-800-359-0944 and we will be happy to help you! 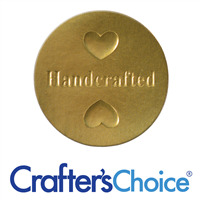 Stick these gold handcrafted seals to your finished cosmetic products for an extra touch. Also adds a more professional look!